I'm just a youngster in this sport. The few pictures I have of when I started are colored. 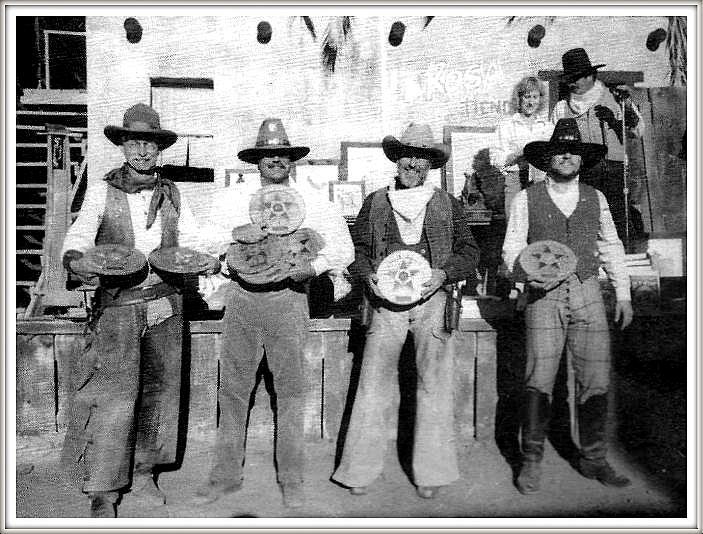 Cutter's Raiders had a buckboard that was mounted on four large springs. Levering the '66 would cause the buckboard to waggle just like it was moving down the trail. When I tried to leap off (yes I could move faster back then) to move to the shotgun my right foot wouldn't move. 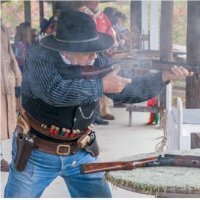 My right spur had gotten caught between two buckboard floor boards. It was fun! 1989 Cowtown Shootout: Phoenix, Arizona Territory. 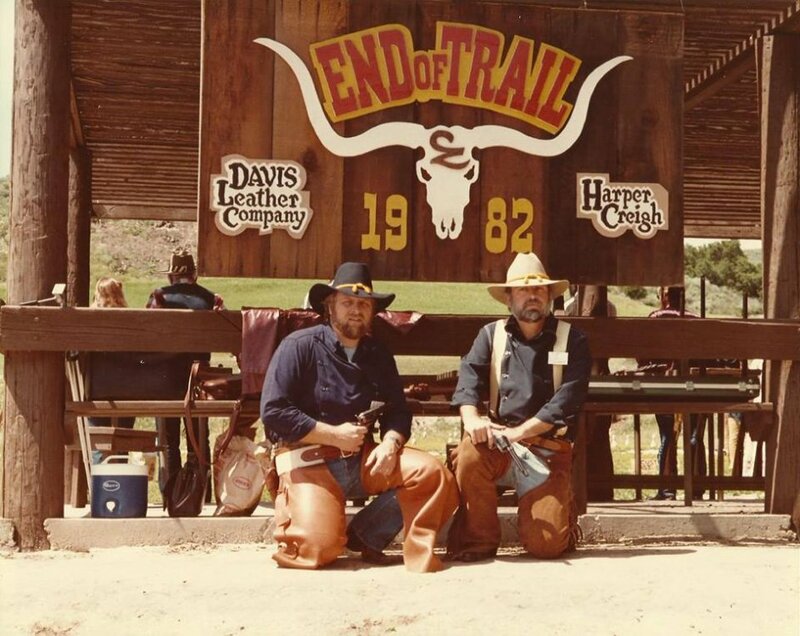 of Davis Leather ... the first two sponsors or End of Trail. Artwork by the one & only Bill Hahn. Who also created John Dwayne (rocking horse cowboy) & the SASS cowboy logo. Flint Westwood, SASS #94, EoT Top Gun, 1983 — with Dennis Martinez. 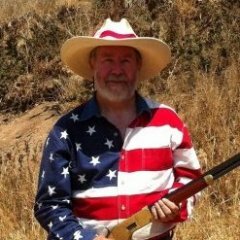 Great thread. In 1984 Gordy Davis was trying to get us in the NW to shoot SASS. This at a IPSC state match mind you. Gordy was a great guy! 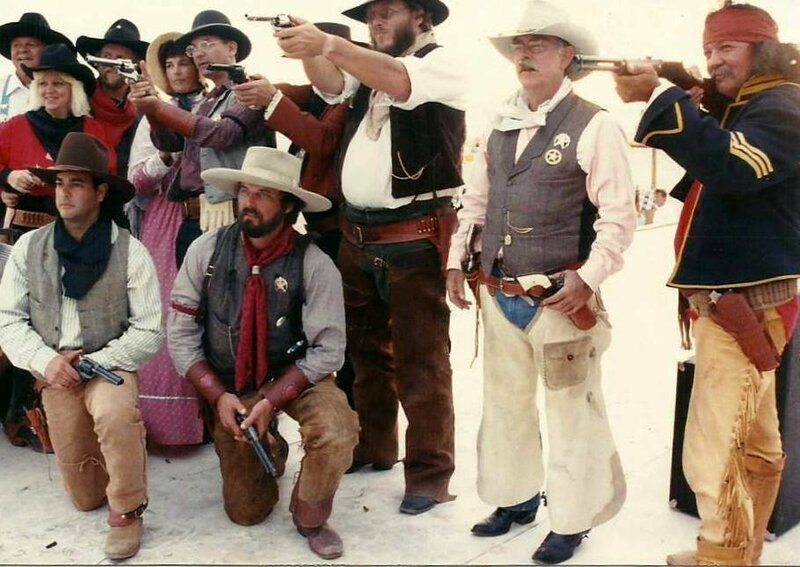 We did eventually start shooting something similar to SASS in the late '80s but usually using just one six gun and many times the lever gun was a 30-30. When did SASS events mandate a second handgun for most stages? Wasn't until the early '90's that folks wanted twice the fun! Before that most stages were 2 gun... pistol and rifle or pistol and shotgun. Thanks McCandless. That was how I remembered it as well. Just glad I wasn't totally loosing my mind. I skipped a few years and by the time i came back everyone was SASS affiliated. Flew into Vegas for a match shooting dbl dualist, which was a new category at the time. Had to be 91 or 92. First time I actually remember shooting two hand guns....but must have prior. Again, great thread. Thank you. Fun to see the photos of a bunch of folks I recognize from BITD. 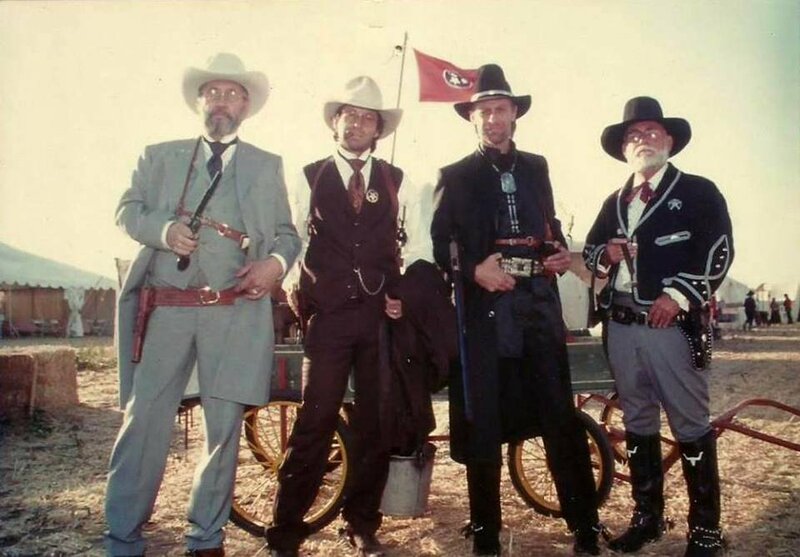 It was the mid-90s before we had two six-guns on every stage. 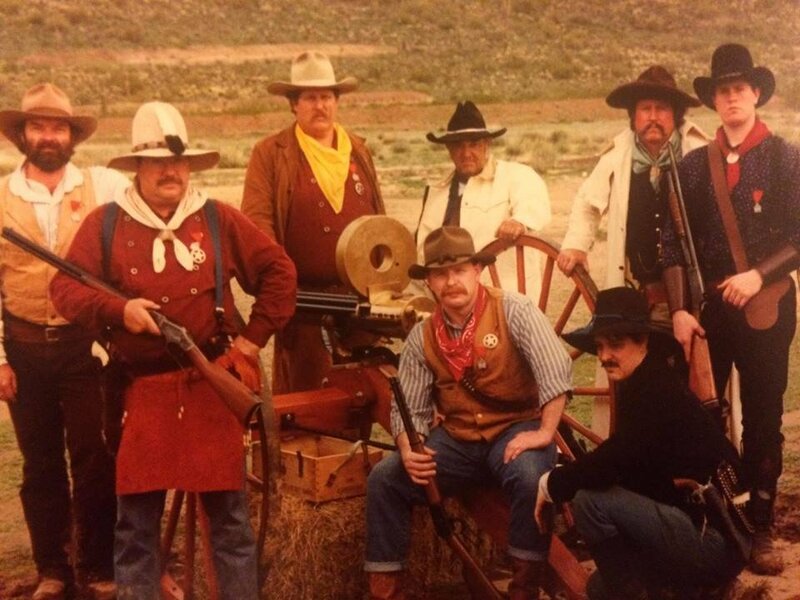 In CA from about '87 we were doin' 3 guns on most stages... It was '85 when Coto de Caza forbid the .30-30 as a main match round. Like the month before I first showed up with mine! These pictures and stories are great. Very enjoyable. Thanks for posting. I'm a new shooter and didn't realize how different things were back then. Those action stages like the Chinese laundry, outhouse, horseback, barber chair, etc. had to be a lot of fun to shoot. Not so much emphasis on time just get through it and have fun doing it. Again, thanks and if you have more please post them. This is not the early, early days. It was taken about 2000. I started shooting in 1999, so it is early to me. Front Row: Burgundy Juno, Billy Blackthorne, Mudville Slim, Montana Maggie Hunter. 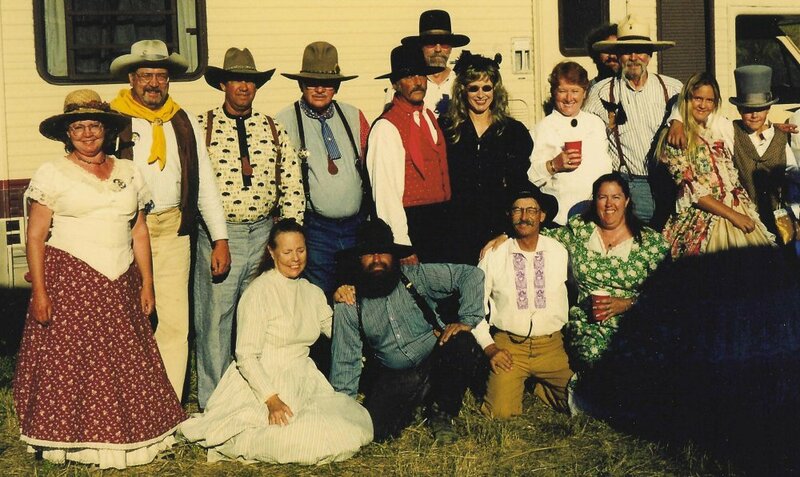 Back Row: Payback Princess (RIP), Jim Jivitus (a dentist, LOL) Cherokee Knight, Billy Briscoe (RIP), Frank Bruce, Jess Brown (my Hubby), Allie Mo, Sterling Starr, Black Jack Traven (hiding), Fiddletown Flash, Sedona Sue, Badlands Bud. Gimmie a Break... that old Goat was never that young! 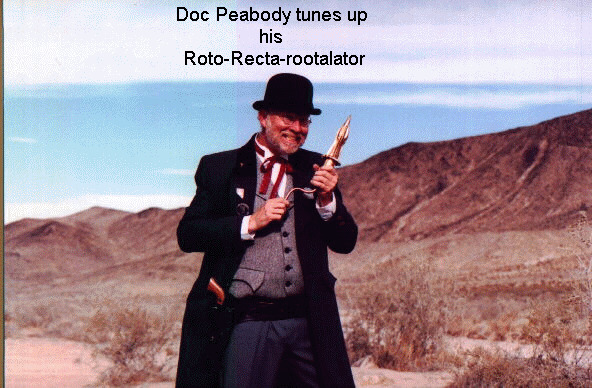 Doc Peabody's website is still out there... so before it disappears I figured I'd transplant some of his pictures here! cruel experiments on Desert Tortoises. 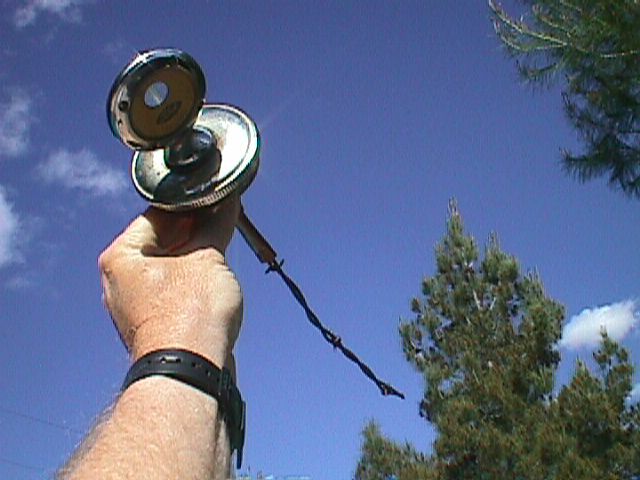 an authentic piece of Colorado Barbed Wire (wahr) as a retention device. be used as a cake decorator. U.S. Grant on the far left. Hipshot kneeling out front. 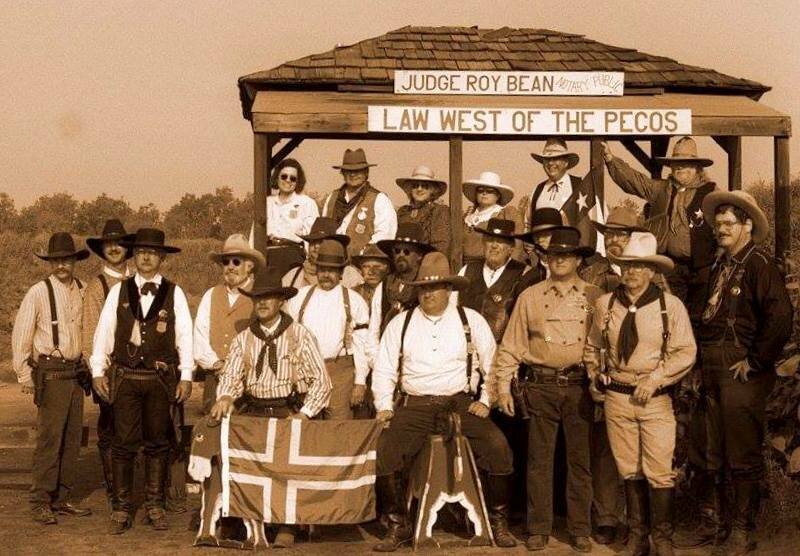 Judge Roy Bean in the white chaps. 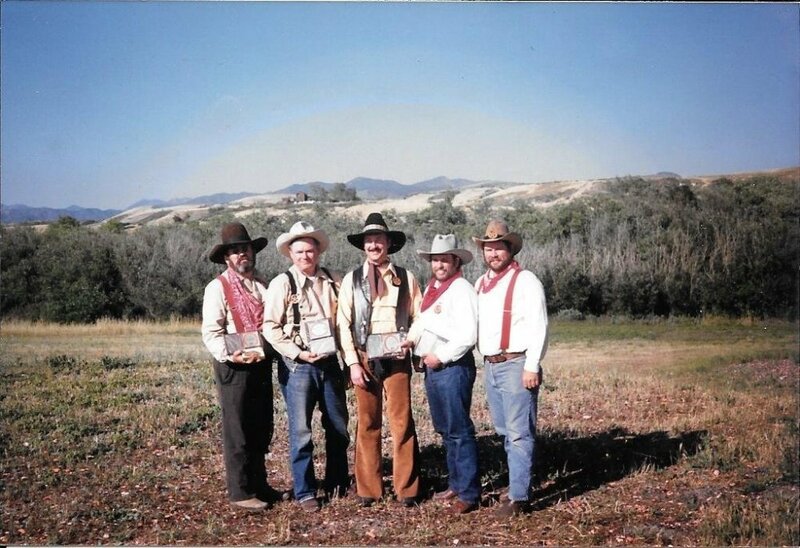 I've skipped over this thread since it was posted..
Yep lots of these old cowboys come and go and just seem also to disappear. 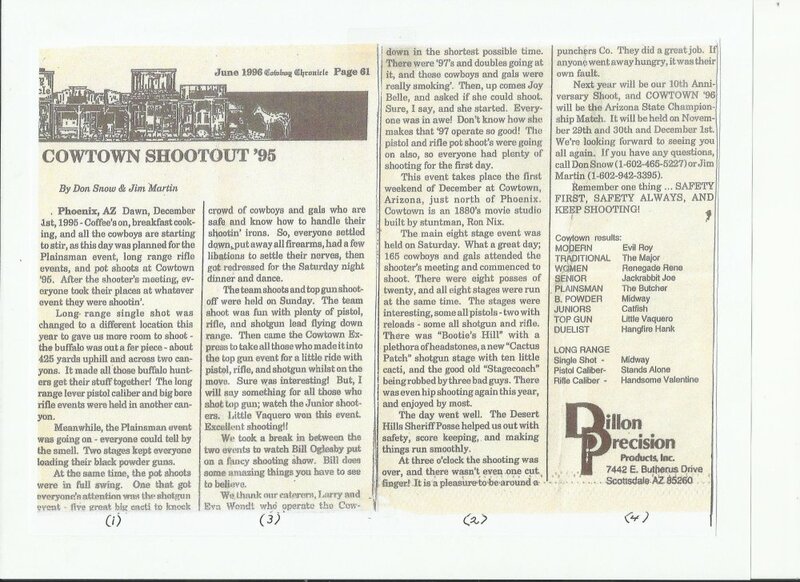 Hers an article from the SASS Chronicle from June 1996 on match that was held at Cowtown in December 1995. I'd like to recall my pard Gordon "Diamond Jim" Davis, one of the pioneers of SASS. He made leather for me that I still use in SASS and IPSC after lo, those many years. 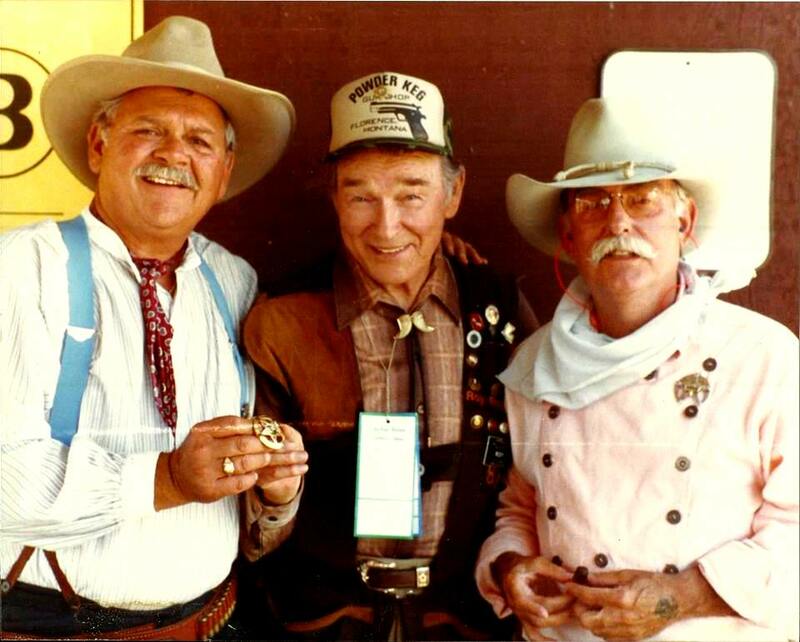 Excepting Ernie Hill, my leathermen have gone west: besides Gordon, Milt Sparks and Bruce Nelson. Fond memories of all. Awesome pics!!! I started in 1996 and really got into it in '98, I'll have to dig up some pics! what a great photo and reminder of the early days. Still in the '80s think. Don't even remember where. Long range side match with a 45/70 Browning and Buckhorn sights. Red when just one handgun was needed. "To the sunny slopes of yesteryear!" So how many of these old-timers were using short-stroke kits and firing mouse fart loads? Most all the early guys were ISPC shooters prior. They'd already seen what the games could or would become. So the answer was...almost no one. But it didn't stay that way long. 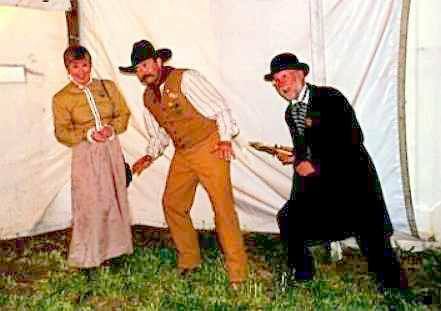 Once it started to actually get really fun the folks from other venues wanted to play cowboy and arms race was on. I like shooting 2 six guns per stage and especially like dualist and gun fighter. But have to say I really liked shooting one hand gun and having a reload required. Slows things down match wise but sure was fun when you could wear a truly historical rig and still play the game. 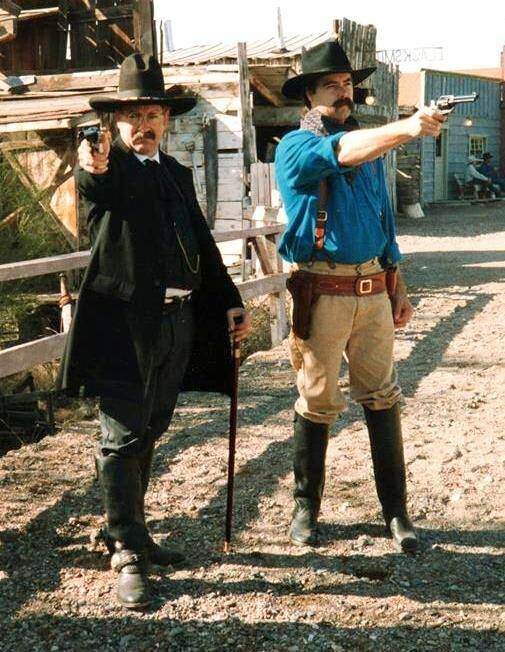 Still have good memories of shooting in a lot of SASS matches in the 90's. 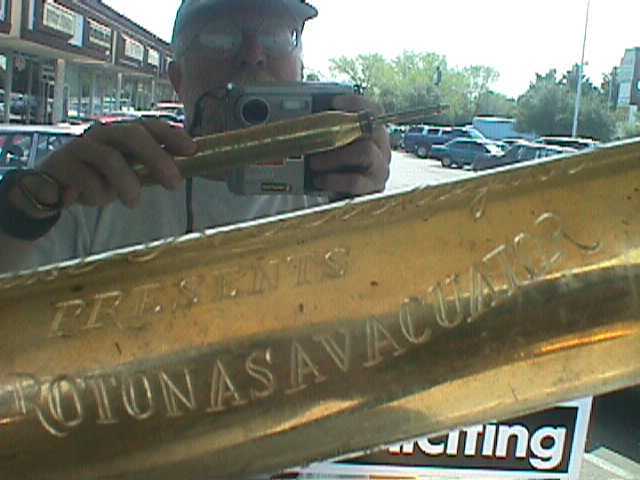 Had to give it away years ago. Good times at Pala with Graybeard and crew, also enjoyed shooting at West End gun club. EOT 94 and 96.. best ever.. full loads black powder. 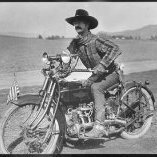 Tex.. greatest times. 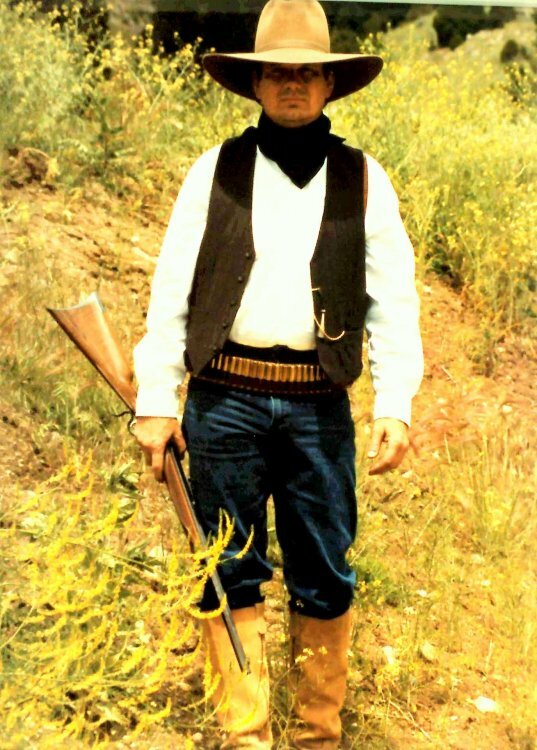 China Camp was a 5-Time SASS Overall World Champion, and was in the first class inducted into the Cowboy Action Shooting Hall of Fame. This interview was recorded in 2006. EOT 1996. 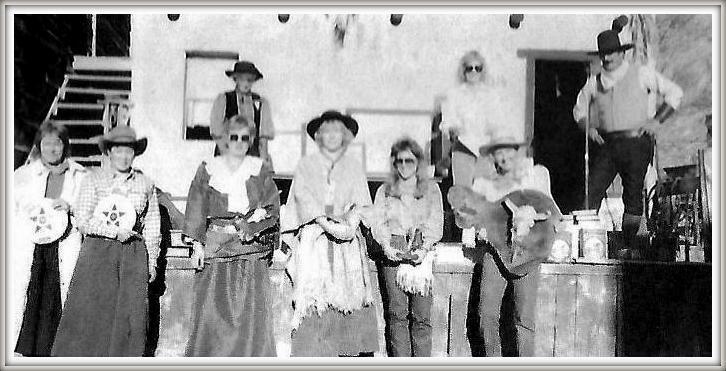 The members of CAS-L tossed their money in the pot to bring Marshal Halloway and his then wife Spring from Norway to Norco to enjoy EOT. Now that picture brings back some memories. I even see myself in there in the centre right next to I think it is Hipshot. 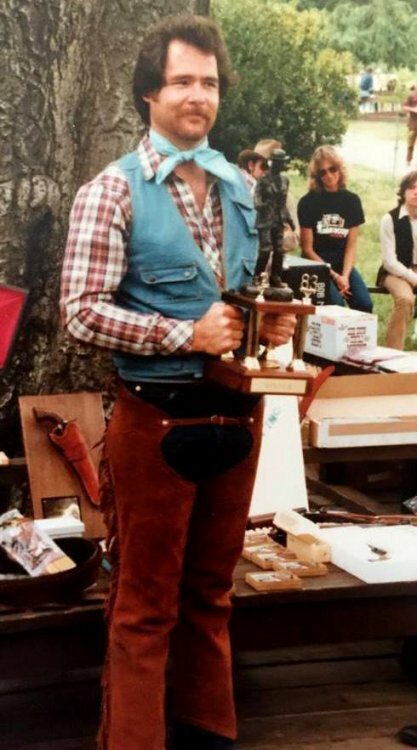 96 EOT, I finished 3rd in Blackpowder. I used to be SASS #3340. Hope can get some more sometime. I am going through my old collection, I think I have a lot of video footage somewhere. 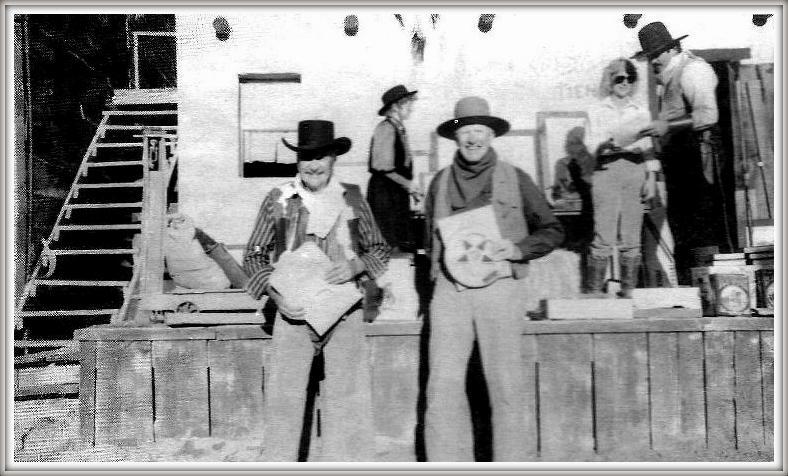 The Cowboys of Norco, The Cajon Cowboys. Now just how in the world did I not make that photo op?